They're back again. We introduced you to them when the Forward's Est Gezunterheit cooking video series started last year. 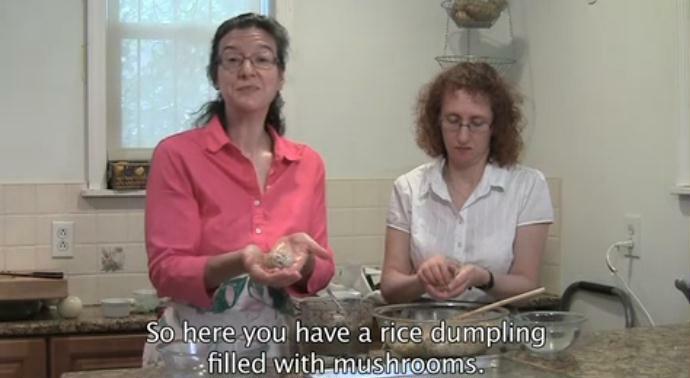 This time the Yiddish-speaking cooking ladies venture into vegetarian territory in a video just posted on YouTube. Using a cookbook printed in Vilna, Lithuania, in 1938, Rukhl Schaecter and Eve Yochnowitz take us through the steps to prepare rice kneidlach (dumplings) filled with mushrooms and onions and served in a mushroom sauce. We like these videos because you get a cooking lesson combined with a Yiddish lesson, just by listening to the light conversation between the chefs and reading the English subtitles. Onions = Tzibelach (we knew this one already, from the old Yiddish curse, "Zolst vaksen vi a tsibeleh mit'n kop in dr'erd - You should grow like an onion with your head in the ground"). The recipe appears at the end of the video. So check your pantry and refrigerator, and be sure you have plenty of butter. Enjoy!